Calling all graphic designers! We are looking for a volunteer to design two very special bird signs, which will be displayed permanently at Rise and Shine Bushland Reserve in Sandon, and at the Muckleford Nature Conservation Reserve. The signs will illustrate the values of the Muckleford and Strangways Key Biodiversity Areas (KBAs), and are a key component of our Caring for Key Biodiversity Areas project. The trigger species for these areas are the Diamond Firetail, Swift Parrot and Flame Robin. 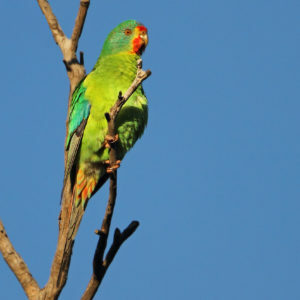 KBAs are designated by BirdLife International and BirdLife Australia. The Caring for Key Biodiversity Areas project involves an on-ground works component, bird surveys and the two interpretive signs. Design of the signs would be an excellent project for a university student who is studying the visual arts, or a graphic designer who wishes to do some pro-bono work to contribute to the community while raising the profile of their business. Purchase of the signs will be covered by the grant, but we need help with the graphic design component as a volunteer contribution. We will be able to supply the written content and quality photos of the target species to use on the signs. But the magic of their presentation is up to you! The signs will be launched in September 2018, so ideally we would have the signs designed by the end of July. We will make a decision and let people know on Monday April 16, so get your applications in quick! And of course, feel free to call on 5472 1594 if you have any enquiries! The Caring for Key Biodiversity Areas projects is funded by the Victorian Government – Community and Volunteer Action Grants.